Stamford AFC could move out of the Evo Stik Northern Premier Division relegation zone tonight (April 4). But it’s a long shot as they would have to win at play-off chasing Stourbridge to over-take Hyde United, who themselves have a tough game at home to leaders Blyth Spartans. Stamford have five games to pull themselves out of trouble. The Daniels are currently one place and two points from safety and they will also have an eye on tonight’s fixture between Whitby and Ilkeston. Whitby are just a point behind Stamford, but have two games in hand. 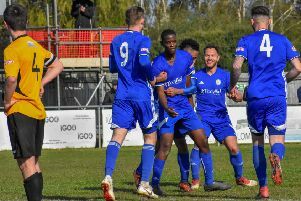 Stamford’s run-in is far from easy as Gary Neville’s Salford City, who are third in the table, are the visitors to the Zeeco Stadium on Saturday (April 9). Holbeach United’s title challenge in the United Counties Premier Division has died, partly because of the sheer weight of their playing schedule, but they could still affect the destination of the trophy as tomorrow they travel to second-placed AFC Kempston Rovers. It’s the first of 11 league games The Tigers must play before the end of a season that is just 27 days away. Yaxley play a second game under the caretaker-management of Andy Furnell tomorrow. The Cuckoos fought back from 2-0 down and a man down to draw with local rivals Deeping Rangers on Saturday (April 2) and next up is an away game at Northampton Spencer who stand just one place above Yaxley in 12th. Deeping are ninth and host fifth-placed Sleaford tomorrow, while Peterborough Northern Star play their first game under new manager Raff Mazzarella when they entertain Kirby Muxloe at Chestnut Avenue. There’s Peterborough League action tomorrow and leaders Moulton Harrox will expect to go 20 points clear at the top of the Premier Division with a home victory over Stilton United. Third-placed Peterborough Sports Reserves are also in action at city rivals AFC Stanground. On Wednesday (April 6) there is the first PFA Final of the season as holders Parkway defend their Sunday Senior Cup trophy against Stanground at Chestnut Avenue (7.30pm). And March Town United Reserves tackle Wisbech St Mary in a repeat of last season’s North Cambs Junior Cup Final at Wisbech Town FC (7.45pm). Wisbech St Mary are the holders. Northern Premier Division: Stourbridge v Stamford. Premier Division: Deeping Rangers v Sleaford Town, Northampton Spencer v Yaxley, Peterborough Northern Star v Kirby Muxloe, AFC Kempston Rovers v Holbeach United. Premier Division (6.30pm): AFC Stanground v Peterborough Sports Res, Moulton Harrox v Stilton United. Division One (7.15pm): Spalding United Res v Sutton Bridge United. Division Two (6.30pm): Leverington Sports Res v Netherton United ‘A’, Whittlesey Athletic ‘A’ v Thorney Res. Division One (6.30pm): Whittlesey Athletic Res v Netherton United Res. Division Two (7,45pm): Oakham Res v Spalding Town. Division Four (6.30pm): FC Peterborough v Parkside. Daniels Cup: Stamford Lions v Uppingham Town. (7.30pm): Parkway v AFC Stanground (Chestnut Avenue). (7.45pm): March Town United Reserves v Wisbech St Mary (Wisbech Town FC).